Assenty was shortlisted for a Most Innovative Use of Digital Technology award in the 2017 UK Digital Entrepreneur Awards and is a Top 20 finalist in the prestigious Northern Stars tech startup competition to find and showcase the best tech startups in the North of England. Your event is fast approaching. Imagine being able to kick-start conversations on social media before it happens using audience insights supplied by would-be delegates. Now you can, with Assenty. Try it! How's the delegate list looking? What if you could involve many more people by inviting questions for the speakers on social media? Questions, anonymous or not, are welcome, before, during and up to 7 days after the event. And you can answer them as they come in. Try it! It's done! Everyone's leaving, how do you get the feedback forms filled? What if you could evaluate the event by sharing a simple poll in an email, or on social media? With Assenty, you can. Try it! Assenty is the only audience engagement tool that helps you deliver the perfect event faster. Enter your event details and get a link to your question board. 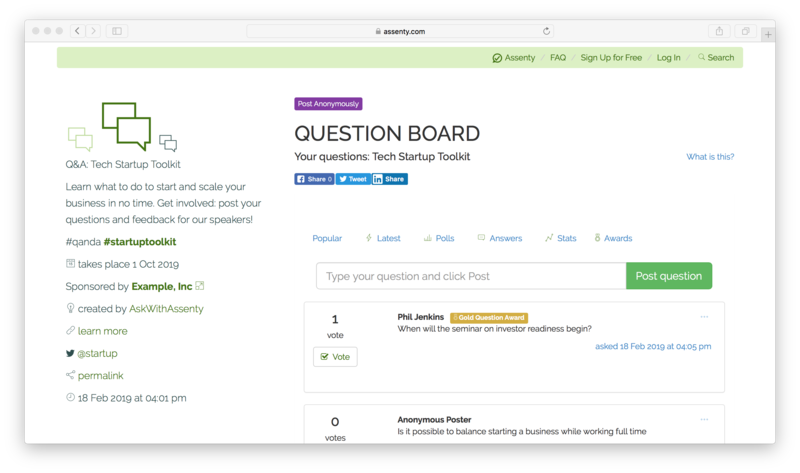 Assenty is designed to be #social: invite questions by sharing the link to your question board. Answer them as they come in. Check out the questions and make your choice. It's free to post questions or vote in polls. You can also ask anonymously. Assenty makes for interactive audience engagement. Get instant feedback by publishing a quick poll. 3. Share your status badge! You scored Gold for daring to ask *that* question?! Share your status badge wherever, on Facebook, Twitter, or embedded on your website or blog. Hashtag automatically included! Assenty rewards delegates for making valuable contributions at your events. Who needs a Question Board? Assenty was written to make it easier to plan and deliver the perfect event. 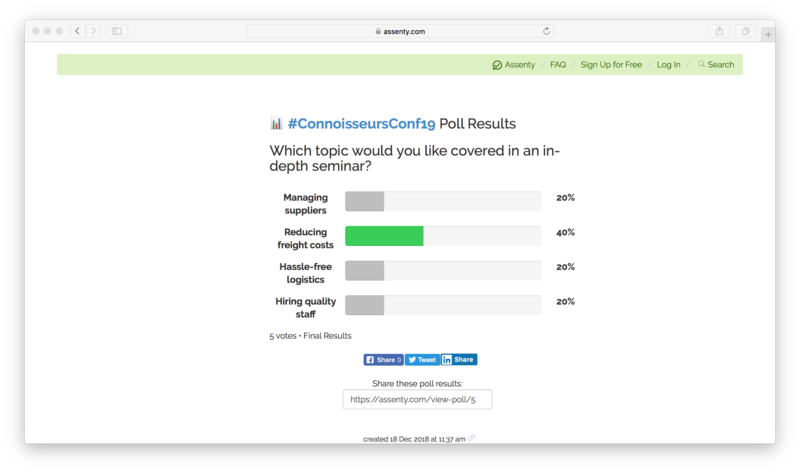 You don't have to be at a conference or seminar to use Assenty, however. 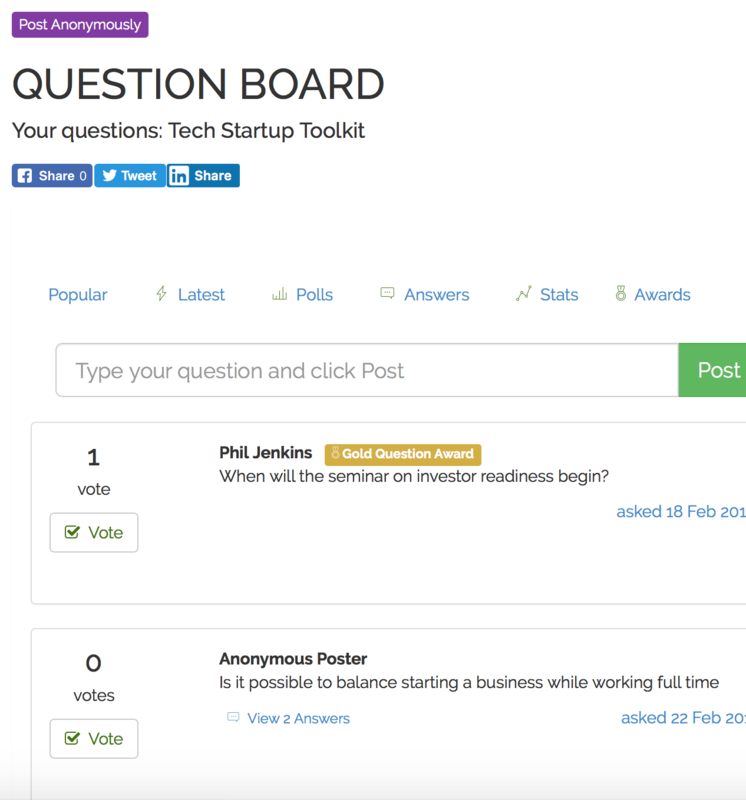 Practically anything with a hashtag can benefit from having a Question Board, somewhere online where anyone can post a question for free and receive an answer in real time. Perhaps you want to run a public consultation, or want to find out what users think of your app's latest feature. A Question Board is a quick and surefire way to get feedback you can act on, immediately. Reward questions, publish polls, and answer queries quickly and efficiently. Want to get started? Click on the button below, it's easy and you'll be up and running in 2 minutes. 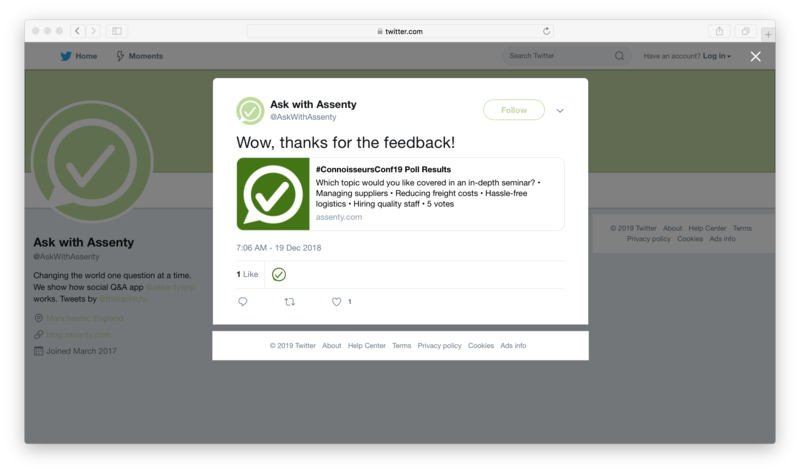 Assenty is a real-time Q&A and live polling web service. We also have a mobile app in the works. Event organisers register their event on assenty.com to get a Question Board, a URL anyone can post questions to, and use the online dashboard to run quick polls and moderate, answer and reward questions. Putting on an event? Your audience's content and opinion is valuable and deserves a home on the web. Assenty aims to be the best resource for submitting questions and getting answers at real and virtual events. We do have an Acceptable Use Policy and ask all users to abide by it.